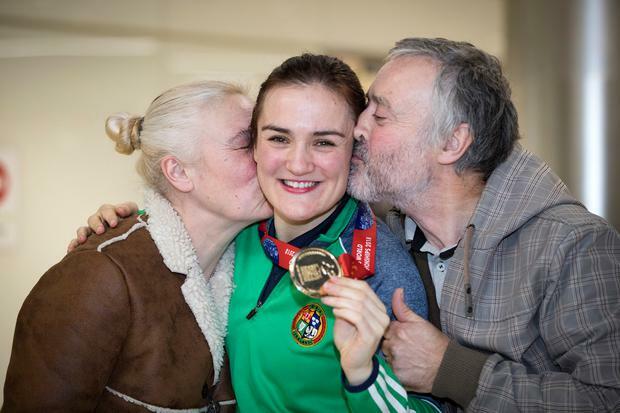 Ireland's new women's world lightweight champion boxer Kellie Harrington arrived home to a heroine's welcome, saying if her win "can inspire just one girl to succeed", that's more valuable than gold. Harrington (28) arrived into Dublin Airport a weary fighter, admitting she hadn't slept since the weigh-in on Saturday for the AIBA World Elite women's lightweight title in New Delhi. She is the first Irish boxer to win two world medals at different weights and a civic reception will be held for her on Sean McDermott Street in Dublin at 6pm today. "I've always had the mentality of being a strong-minded person, so once I set my mind on something, I know I can achieve it," she said. "Once I started believing I was going to be world champion, I knew I could do it. "It's been very difficult to get to this point but it's the difficulties that make this so worth it. It's those difficulties that make a person, and with great losses comes great success. "To stand on that podium and get the gold medal was so emotional. It hasn't quite sunk in yet. But if I can help encourage just one girl, that's more important than any medal. "To walk through these doors as a world champ is to give back something to Dublin 1." Harrington's family, including her parents, Yvonne and Christie, were at the airport to welcome her home. Mr Harrington, on the verge of tears, handed out Irish flags with all the team members' names printed on them. He had spent hours getting them ready. "It was about remembering every single member of the Irish team," he said. "I always knew my daughter could do this. She always believed, so we just knew. I'm incredibly proud, there are no words." Ms Harrington said her daughter had been fighting since childhood. "Kellie always loved boxing... She's achieved so much and it was always in her," she said.